If your aircraft are worn, they may cause an incident or break down. That’s why you should maintain them so they won’t have to be grounded. A tutorial is available for this article. Of course, you can repair and maintain your aircraft to avoid any disturbance on your routes and keep making your passengers fly with certainty. 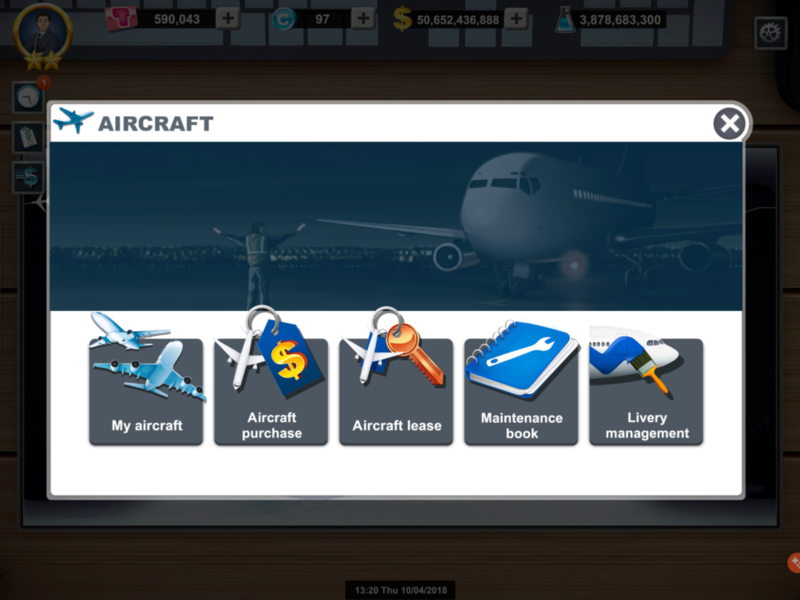 You can see the state of all your aircraft in real time with the “Maintenance book” in the “Aircraft” section. The number of incidents over the last 30 days. The amount of repairs of these incidents over the last 24 hours. The proportion of your aircraft by wear: the wear rate represents the current state of your aircraft. It is indicated in percentage. The higher it is, the more your aircraft may have an incident and the more these incidents may be critical. The wear rate of each aircraft evolves differently depending on its model. You can see the wear speed of each aircraft in its corresponding report. Only repair your aircraft if their wear is higher than 10%! The more you aircraft is old in the real world, the faster it will wear. 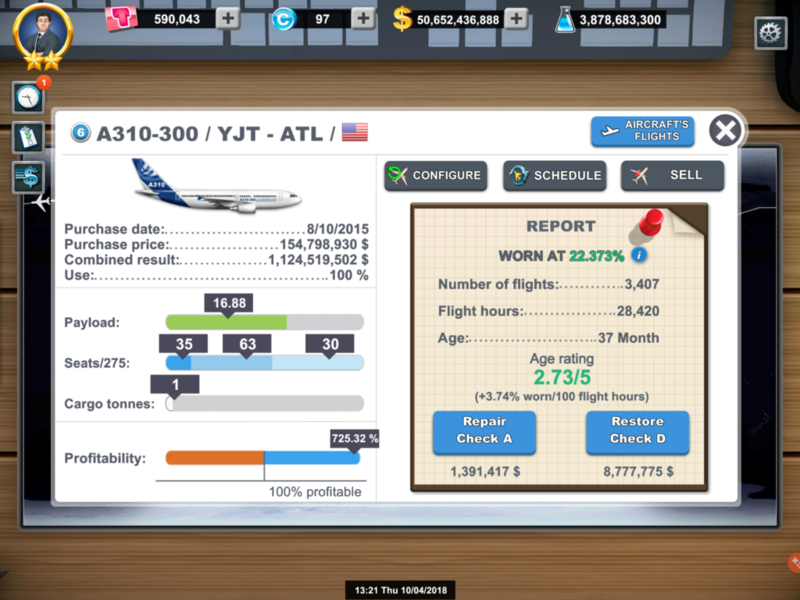 You can see the wear speed in the report details of your aircraft on the web version or during its purchase. The proportion of your aircraft by age: the age rating represents the age of your aircraft since its last heavy maintenance visit. It ranges from 1 to 5: 1 for an aircraft which has just left the factory, 5 for a very old aircraft. The age rating directly affects the speed at which the aircraft’s wear rate increases. In other words, an aircraft with an age rating of 5 will wear much faster than an aircraft with an age rating of 1. Each month, the age rating of your aircraft will increase by one point. In the history of incidents, you can tap an aircraft to see its characteristics in details, such as the wear rate and the age rating. 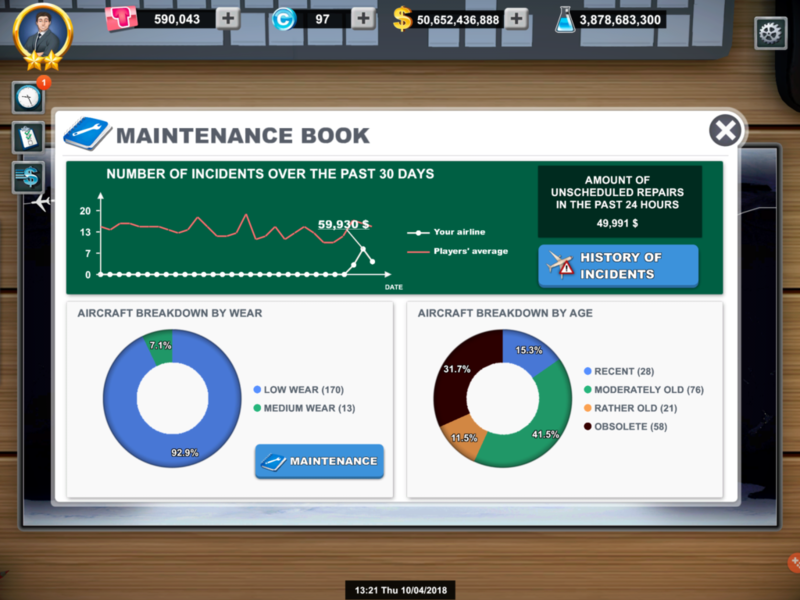 In your maintenance book, tap “History of incidents” to view the detail of all the incidents that happened to your aircraft over the last 30 days in a chronological order. 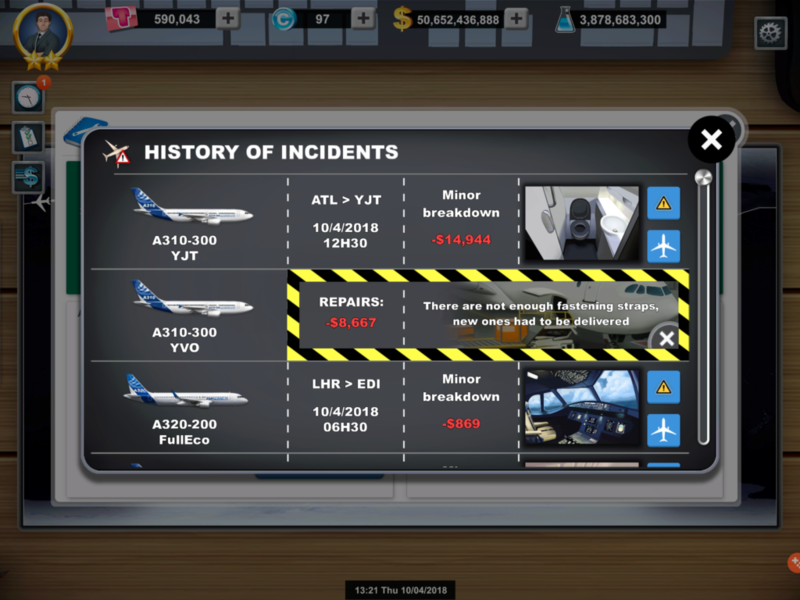 Tap the icon with the yellow sign to see the aircraft’s incident and its price. Minor and moderate incidents (up to 80%), which did not impacted the flight: yellow sign. Major incidents (between 80% and 99%), which prevented the aircraft from taking off: red sign. Critical incidents (from 99%) which ground the aircraft until it is totally repaired: STOP sign. The A Check is an aircraft maintenance visit that enables to detect or replace worn elements. It is little expensive and will reset the wear rate of the aircraft at 0%, thus preventing all breakdowns from happening for a certain time. The D Check, also called “Heavy maintenance visit” consists of disassembling the aircraft so every part can be examined and repaired before being reassembled carefully. This process is more costly but will enable to reset the aircraft’s age at 1/5 and the wear rate at 0%. A D Check HAS NOT to be performed regularly, once every 2 or 3 months can be enough… You can also perform none at all, but please note that your aircraft will wear quickly. Your aircraft keep flying while maintenance checks are performed. Thanks to that, your turnover remains steady but it also means your aircraft keep wearing. As a result, you can find two payments in your cash account when you perform an A Check or a D Check. A down payment when the maintenance operation is carried out and a remainder when you confirm the task from the delivery list. 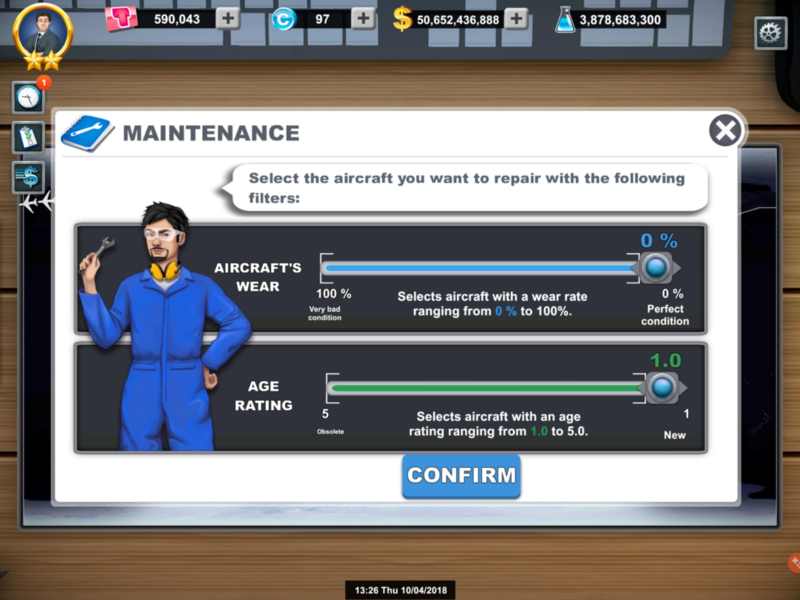 In the Maintenance book, you can tap “Maintenance” to sort the incidents of aircraft by wear and age rating. Big airlines will be happy to hear that it is possible to perform grouped A Checks and D Checks to save time. You can choose the proportion of aircraft you want to repair depending on their wear, their age, and the type of aircraft you want to repair. After defining the filters of aircraft incidents, you can see the restoration cost and the repair cost for each aircraft type. Once you have browsed enough information about your aircraft, it is time to repair them. The A Check, a repair of your aircraft. The D Check, a complete review of your aircraft as if they had just left the factory. Bob from the Maintenance who does wonders when it comes to repair. 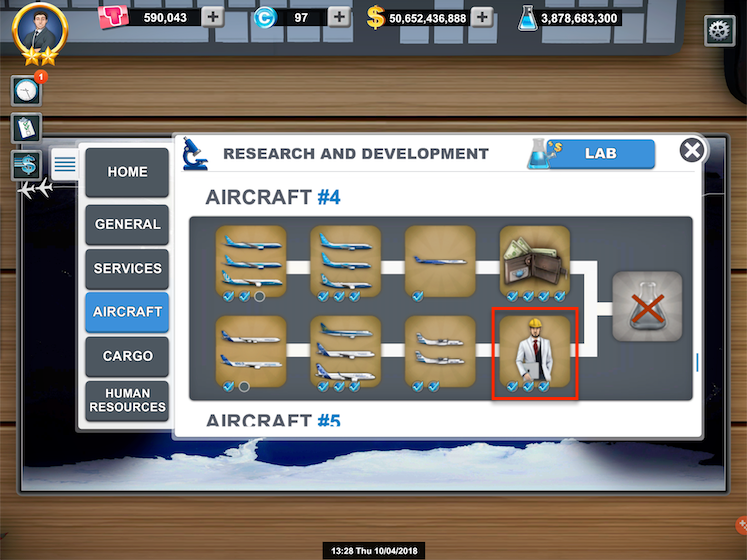 You’ll find several researches specifically created for the Maintenance by going to “R&D“, then “Research and Development” and finally “Aircraft”. I can find the researches proper to the Maintenance in the bottom-right corner of each research level. Slow down the wear speed. Slow down the increase of the age rating. Reduce the D Checks’ price. 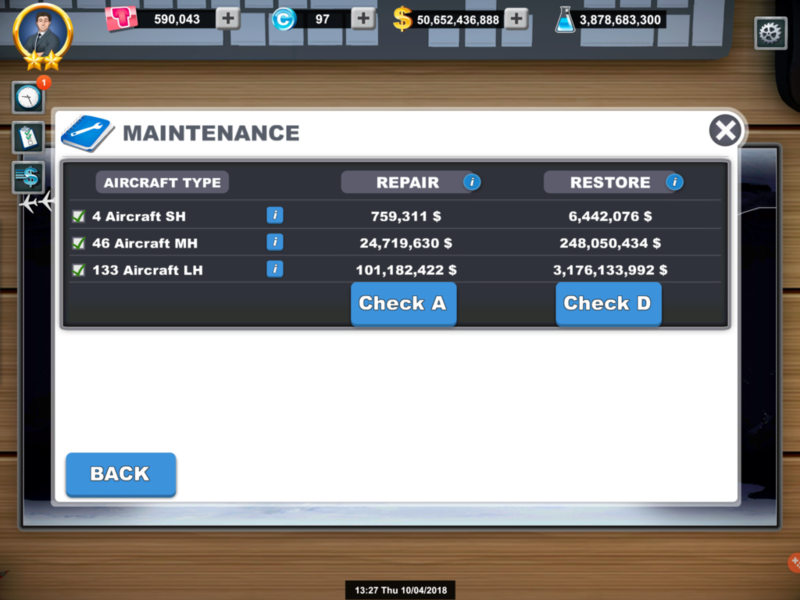 The amount of your Maintenance costs on D-1 is available in “Finances”, then “Financial summary“. The real calculation of your Maintenance costs on D-1 (average costs for one day) is the addition of: A Check (of the last 60 days) + D Check (of the last 60 days), the total divided by 60 days. An estimate of your Maintenance costs in relation to your current aircraft is established from April 25th to August 3rd. The more time goes by, the more this estimate will become equal to your real costs. Breakdowns may cancel your flights and may financially impact your airline through your Structural Profit. Flights profits (D-1) – payroll (D-1) – Maintenance costs (D-1) – weekly rental fees / 7 – weekly loan repayments / 7 – weekly alliance tax / 7 – last deducted tax / 7. Amount of expenses for the “A Check”. Amount of expenses for the “D Check”. Amount of expenses for the “Incidents“. Amount of expenses for the “Repairs“.